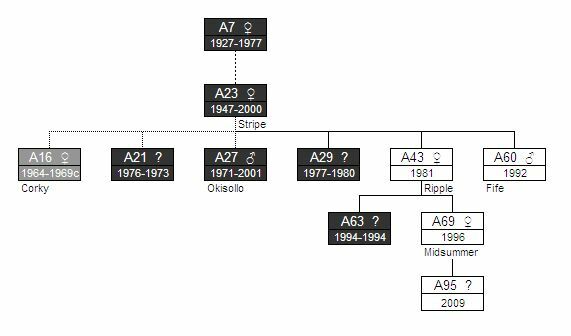 After the death of A23 in 2000, this matriline could now also called the A43 matriline and consists of Fife, A60, brother of Ripple, A43. Ripple had two calfs, A63 which died in the same year 1994 when it was born and Midsummer, A69, born in 1969. 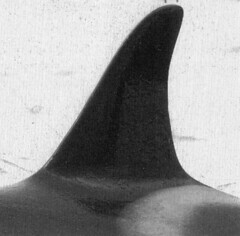 A23 Stripe was captured in December 1969 with her probable calfs A16 and A21. She and A21 where released. 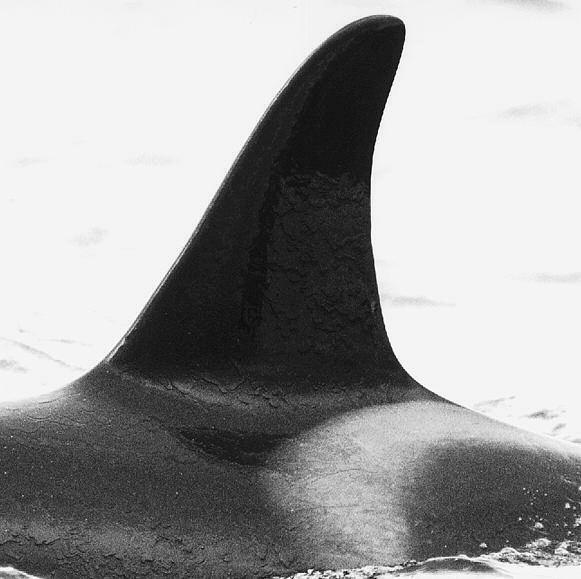 A16 was captured, along with several other Orcas, on December 11, 1969 in Pender Harbor, British Columbia, Canada. 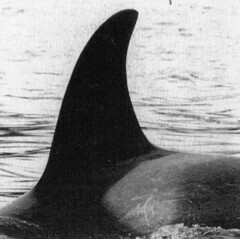 Corky was placed in a small pool with an adult male, Orky (II) also caught in Pender Harbor the year before her own capture. 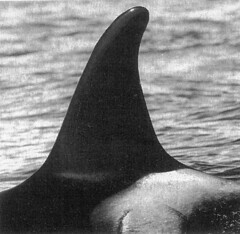 The two Orcas remained together at the park for the next seventeen years. 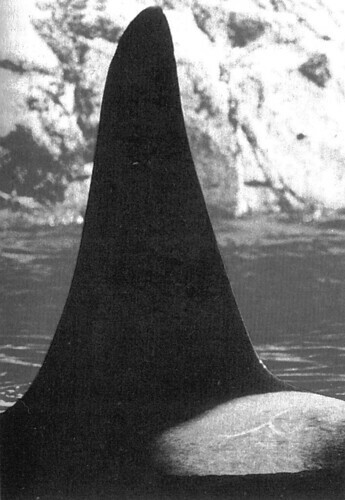 During her time at Marineland, Corky became the first orca to become pregnant and give birth in captivity. With her first calf, nobody even knew she was pregnant. On February 28, 1977, the first calf to be born alive in captivity was born at Marineland to Corky and Orky. The calf was a male and died after sixteen days. Corky went on to give birth six more times while at Marineland. Kiva, the longest surviving calf, lived only a total of 47 days. There are several reasons as to why Corky's calves didn't survive. The first might be that she was captured too young to have learned how to properly take care of a calf. Though, even after she went through training to teach her how to nurse, the calves continued to die. Another reason the calves died so young could be attributed to the shape of Marineland's pools - small circles. Corky had to continually push her calves away from the walls and could not properly present her mammaries to the calves so that they could nurse. 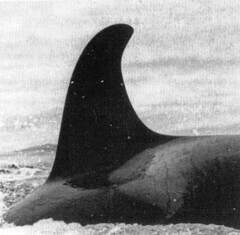 Her time at Marineland ended in January of 1987, after the park was sold to SeaWorld. Corky, then pregnant for the seventh time, was moved with Orky a few hours south, to the park in San Diego. There, at SeaWorld, Corky suffered a miscarriage. On 26 December 1973 A21 was struck by a ferry, the M/V Comox Queen, a ship that is part of the BC Ferries fleet. The ship was en route from Comox to Powell River when it encountered killer whales. The pod consisted of a bull, cow and two calves. It was one of the calves that had been struck by the ship's propellers. The cow and the bull cradled the injured calf between them to prevent it from turning upside-down. Occasionally the bull would lose its position and the calf would roll over on its side. When this occurred the slashes caused by the propeller were quite visible. The bull, when this happened, would make a tight circle, submerge, and rise slowly beside the calf; righting it, and then proceed with the diving and surfacing. While this was going on the other calf stayed right behind the injured one. It appears that the young whale did live for at least fifteen days. We later received a report from a resident of Powell River, who, on 10 January. 1974, observed "two whales supporting a third one, preventing it from turning over." We do not know whether the whale survived after this, as we received no further sightings or photographs from which we could identify the individual. We suspect, however, that it might have been a young A5-pod whale identified as A21, which was last seen in 1973. 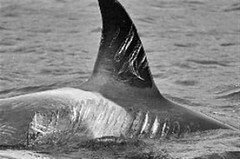 A little before 7am on July 27th 2003 a large group of orcas passed OrcaLab close to the Hanson Island shore, heading towards Johnstone Strait. The orcas were moving quickly in a tightly packed group, their dorsal fins rising and disappearing almost in unison. Peering through spotting ‘scopes, we were startled to see a large reddish patch that appeared to be a fresh wound in the area of the saddle patch on an individual in the middle of the group. The patch looked raw though it was not obviously bleeding. We were unsure as to the whale’s identity. 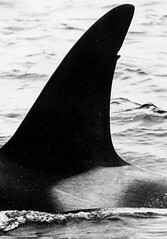 A few days later, one of the whale watching vessels reported a huge wound on the right side of an orca. Then, on August 2nd, DFO researcher Graeme Ellis positively identified the injured orca as A60. The wound is huge and was almost certainly caused by the propeller of a fairly large vessel moving at considerable speed. Photographs show a series of deep cuts in A60’s right side beginning in front of the saddle patch and extending well behind it. Some of the cuts appear to have gone through the blubber layer. The images presented here, taken by photographer Rolf Hicker (http://www.hickerphoto.com/), show that A60’s wound is serious. A60 (Fife) is 11 years old. He is a member of the A23 matriline of the A5 pod. This group suffered from two captures, in 1968 and 1969, during which it lost the majority of its members. 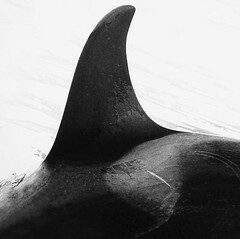 Over the years, several A5 pod members have suffered major injuries caused by vessel propellers. 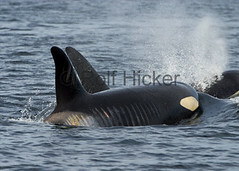 The pod’s matriarch, A9, had scars on her back almost to her backbone. Another member (A21) died after being struck by a ferry propeller in 1973. A60’s mother A23 (Stripe) had several major injuries though not all were caused by propeller strikes. Today, the A5 pod has just 8 members in the wild, a number that is down considerably from the 13 of four years ago. One additional member remains captive. 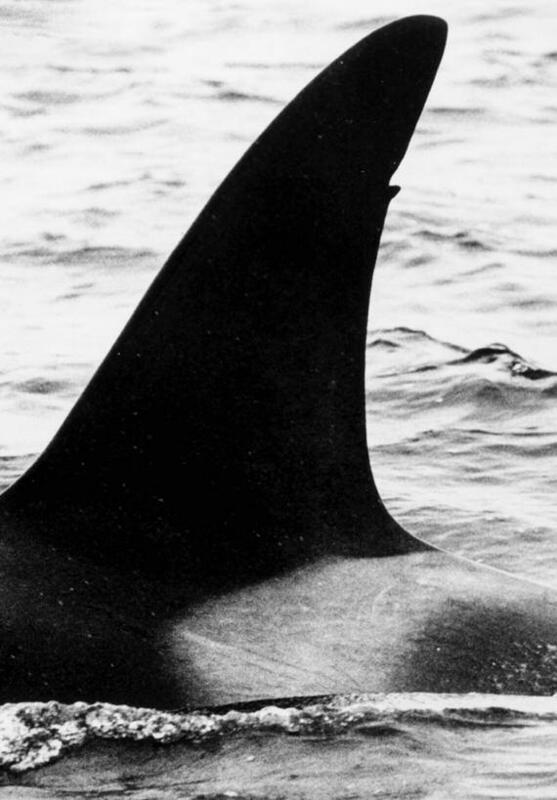 She is Corky, A60’s oldest sister, one of just two survivors from the era of “live captures” that took place in the 1960s & ‘70s and devasted the orca populations of the Pacific Northwest. We cannot know if A60 will survive his injury. At this time he still looks strong and is having no apparent difficulty keeping up with the other orcas. But infection could easily set in. In the days ahead, we will be watching him closely, and hoping for his recovery from this tragic (and unnecessary) accident.